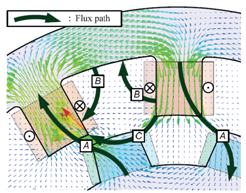 While the switched reluctance motor (SRM) has become an interesting concept of electro-mechanical energy conversion due to its robust, simple and cost effective construction, the research at the department Leistungselektronik und Elektrische Antriebstechnik (LEA) also addresses other areas of research in this topic. 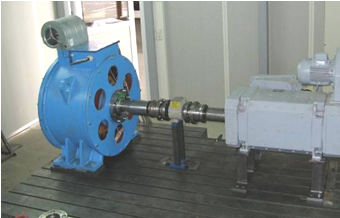 The foci are to minimize the torque ripple and to minimize the effective phase voltage demand so to maximize the drives efficiency. To do so it is necessary to identify the flux linkage and the different inductances. These values are determined with the three-dimensional Finite-Element-Analysis (FEA) tool- Ansoft Maxwell 3D. With the results of the FE Analysis it is also possible to easily check the efforts of mechanical modifications like variation of the airgap or the back iron. Another way to increase the drives efficiency is to optimize the FPGA based control structure via self-optimization for specific operating points. The Lagrange method is used with respect to constraints like constant torque demand as well as maximum phase currents (see Literature ), which was developed in the course of the Collaborative Research Center 614 – Self-Optimizing Concepts and Structures in Mechanical Engineering. 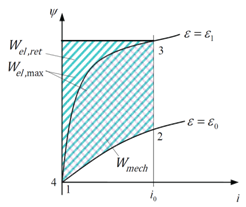 The results from this method are optimized phase current trajectories with tradeoff between variance of torque and overall efficiency η (see figure 3 below) compared to traditional control schemes. Another researched topic is the energy transfer from the stator to the rotor. This implies on the one hand more effort in the rotor construction but offers on the other hand a contactless secondary power supply. Especially transportation systems like elevators or rail-bound vehicles with linear drives, which have a demand on energy supply for light or air conditioning on the car, are ideal applications to use the motor as a transformer. For common switched reluctance drives, the surplus energy Wret is undesired as the power electronic devices have to be sized for the entire electrical work Wel,max. The idea of the presented doubly-excited SRM is now to transfer this stored energy, at least a part of it, as Wtrans to the secondary for supply of auxiliaries.